Hope for Health is a community driven project of Why Warriors, headed by a steering committee of 12 Yolngu ladies and Dr Kama Trudgen. One in two adults in remote Indigenous communities like Galiwin’ku are struggling with chronic disease. This is a result of the marginalisation of traditional practices, and a lack of understanding of the link between lifestyle choices and health. Education in the peoples own language to understand how nutrition can help them. Our First Yolngu Health Retreat was a success. You can still donate here. We need ongoing help to support more Arnhem Land Aboriginal people to get control of their health. When the American-Australian Scientific Expedition to Arnhem Land came in 1948, they found the Yolngu people were in very good health, with no chronic disease issues. Fast forward some 60 years later, and Yolngu people find themselves in the midst of a devastating health crisis. The United Nations report ‘The State of the World’s Indigenous Peoples’ (2009), indicated Australia and Nepal have the world’s worst life expectancy gap between Indigenous and non-Indigenous people. Chronic disease is responsible for up to 80% of the mortality gap between Indigenous and non-Indigenous Australians. Indigenous Australians living in remote communities are 4 times more likely to have Diabetes than other Australians. 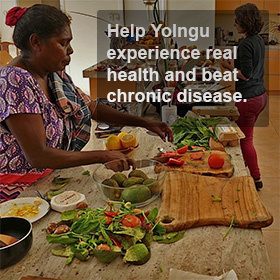 In response to this crisis in living, Dianna Biritjalaway and her doctor friend Kama Trudgen have initiated this inspirational community driven campaign to improve Yolngu health through a combination of the latest Western nutritional science and the traditional Yolngu diet. The Hope for Heath steering committee has a long term vision of establishing a permanent Health Retreat in Arnhem Land that forms a transformative hub for people to experience vibrant health. Combining the best of Yolngu traditional knowledge, modern nutrition, and alternative healthcare practices, it will be a powerful place of healing and health wisdom. The retreat will be run and staffed by Yolngu people, creating meaningful, culturally appropriate local employment options that not only nurture healing, but promote the re-establishment of local industry. 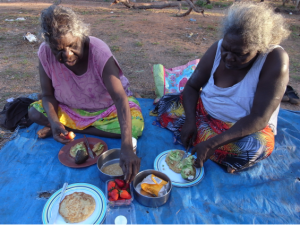 We have now run our first 2 week Yolngu Health retreat and we intend to do more each year, but the goal is to have somewhere people can come when ever they need. Education on understanding chronic disease cooking and exercise. To find out more, visit the Hope for Health website. Get right in the midst of this life changing program, join the HFH team. We are now hiring. See Vacancies for more information .